Has you computer crash? Nobody likes it when their computer freezes (also known as a computer hang). It is even more irritating when it crashes. A lot of people do not know how to deal with this situation. It's quite easy actually. All you need to do is follow a few instructions. There are several reasons that would make a computer freeze or crash. Check your hardware to see if there is a mismatch of components. Aluminum migration and Electro Static Discharge can make your PC very unreliable. Check your operating system since some versions of Windows and other operating systems come with harmful bugs. Check the status of your drivers because down-level drivers are problematic. Look at the recently installed software and see if there is a malicious application in the midst. If you have been receiving the message, "system is low in resources" then your computer is suffering from memory fragmentation. 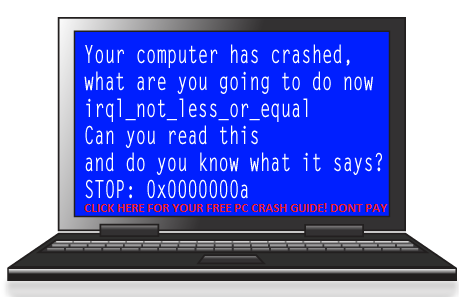 A computer freeze can lead to a crash if it is not dealt with in a timely manner. Inspect your CMOS Settings to ensure they are properly adjusted. Once you ensure that your CMOS is properly installed you should then use it to diagnose hardware problems. The order in which the components of your computer's software are loaded at startup could be the cause of your problems. At times you have to restart your computer if it hangs or freezes. This will buy you some time. When your computer starts hanging and crashing you should consider formatting your primary/ main hard drives. This will delete everything from its memory and give you a fresh start. In this case you will have to reinstall the programs you need. Be careful when you are installing programs afresh so that malicious software doesn't get you again. You can combine all of the above suggestions. Defects will only show up in certain circumstances. Move your computer from a place where there is too much heat since this can easily damage the internal components. Even when your computer crashes you should understand that damage to hardware is usually temporary. Do not allow under-trained technicians to install components in your computer. They may cause Electro Satic Damage to the internal parts. Ensure that your cables are not loose. Don't let software run at 100 percent. It will cause your machine to deteriorate. Use only genuine hardware and software. This way you will avoid those irritating crashes.